Saunas and steam rooms, aren’t they the same thing? Well, not really. Saunas and steam rooms can have a similar therapeutic effect on your body, but there are some fundamental differences between the two that we should be aware of. 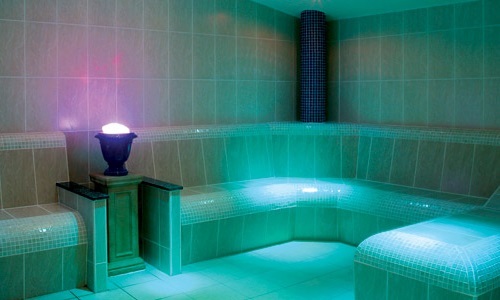 So let’s dive a little deeper into saunas and steam rooms and analyze the benefits of both. The number one difference between Saunas and Steam rooms is humidity. 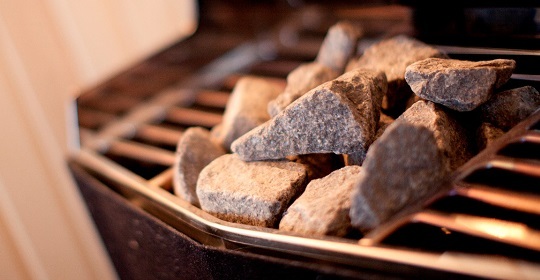 The heat generated in a sauna is generated by a heater that heats up a pile of sauna rocks. These rocks heat up the air in the room but it is a very dry heat (a bit like when you sit in front of a campfire). If it is getting too dry, you can create some humidity by pouring water over the hot rocks which will make steam in the air, but this is only temporary. Saunas will have a vent to bring in fresh air and release the humid air outside, keeping the humidity of the sauna quite low. Steam Rooms, on the over hand, are heated up by a machine called a steam generator. The Steam generator boils water turning it into steam and continually releases it into the room. Steam rooms are kept airtight, so that the humidity level can reach 100%. 2. Temperature: Which One Gets Hotter? The temperature in a sauna can vary, depending on the type of sauna you are using. Saunas are typically hotter than steam rooms, as the lack of humidity means your body can withstand higher temperatures. A usual sauna may reach between 160 to 200 degrees Fahrenheit with the humidity between 5 to 30 percent. Steam rooms max out at about 110 to 120 degrees, but with the added effect of 100% humidity that keeps your sweat from evaporating you will feel much hotter. Both Saunas and steam rooms will have multiple levels for sitting, and the higher up you sit the warmer you will be (as hot air always rises). As mentioned before, the layouts of a steam room and a sauna are pretty similar, but the materials used to build them are very different. Saunas are made almost entirely of wood, Spruce, Pine and Cedar are popular choices, and are commonly found hardwoods in Nordic countries where saunas were first invented. Wood is able to absorb the excess humidity in the air, keeping the environment nice and dry so that higher temperatures can be reached. Steam rooms, on the other hand, need to keep the humidity in the air. Therefore they are often made from tiles, glass and plastic as these materials do not absorb moisture. They are also much easier to clean. This is great, because the intense humidity can quickly lead to mold if not cleaned and sterilized regularly. This may be why steam rooms are usually the more popular choice in public gyms. Wood, in the long-term, is harder to keep clean, and will need to be replaced at some point. Sauna vs Steam Room: Which Is Better For You? Now you know what the differences are, it’s time to decide which of the two is best for you. Both saunas and steam rooms will have the same therapeutic relaxing effect on your body by exposing it to high heat, relieving muscle tension and improving circulation. By encouraging your body to sweat your pores will also open up and assist with cleansing your skin. Whether you decide to go for a sauna or a steam room will depend mostly on your heat tolerance, Saunas are great if you are wanting much higher temperatures, but it will be a dry heat, that for many people may be far more bearable. People who suffer from arthritis or joint pain may find a sauna more enjoyable than a steam room, as the humidity may cause their condition to flare up and cause pain. Steam rooms in turn may be more comfortable for people with respiratory problems such as Asthma. The dry heat found in a sauna can also induce coughing and discomfort for those with a pre-existing condition. It may also prove more effective if you are suffering from a cold or a sinus infection. The humidity of a steam room is usually better for your skin, as the dry heat of a sauna can very dehydrating and irritable for those with skin conditions such as eczema. There is a prevalent myth that spending time in a sauna or steam room is great for weight loss. You may well lose some weight after a session, but keep in mind that this will mostly be just water weight you have lost from all your sweating! You may find a Sauna easier to keep clean and sterile due to the lack of humidity, unlike a steam room which will always need to be thoroughly cleaned to prevent mold growth. You will however need to stain and maintain the wood in a sauna, staining it roughly every 6-12 months with a protective heat resistant oil or sealant. Pest control is another consideration for a sauna, as the warm dry conditions may attract critters like cockroaches and mice who are looking for a nice warm hiding place. The Sauna or the steam room, this will always remain a point of discussion and different people will always have different opinions and preferences. And that’s just fine. In my opinion, both are good, and I don’t prefer one over the other. I am lucky in the sense that I can handle dry heat and moist heat very well, but I do have a preference depending on the time of day. A sauna works best for me if I feel that I need to relax or unwind after a hectic day. A steam room works best for me when I don’t have time for a workout but I do want to quickly get my heart rate up. The moist heat in a steam room usually has that effect on me. Hopefully this summary has given you a bit of an idea what the differences are between saunas and steam rooms. Do what’s best for you and enjoy the sauna lifestyle.